Are you in an industry that demands air purity at 100% clean levels? Compressed air is only as good as its purity. When your process is exposed to oil, it becomes more difficult to keep air clean, increasing the costs you’ll face — especially as you use more and more air. To address this concern, many companies are turning to oil-free or oil-less air compressors. Today, oil-free compressors are becoming more common because they offer cost savings. There’s no need to collect or dispose of oil-ladened condensate. Downstream filters have reduced replacement needs, because they’re not filtering oil. Energy costs are minimized because there’s no need to increase force — some fluid-flooded units can see a downstream pressure drop due to filtration. Reduced oil costs, because there’s no need to continually refill your compressor. Typically, these units can unload within two seconds of the command to unload, and will use about 18% of their full load horsepower when unloaded. Those savings can be very tempting. To see if you can make use of the oil-less compressors, you’ll need an understanding of how the compressors work and in which applications they work best. For absolutely 100% oil-free compressed air, you need an oil-free compressor. The basic principle of the oil-free screw compressor is same as for the oil-injected compressor. But as the name suggests, there is no oil injected during compression. Purity and environmental benefits will often translate into other savings that may reduce your overall ownership costs. Click the link below to see why oil-free compressors are the best option in most applications. Reciprocating air compressors use positive displacement, which generates air pressure via two sides that provide either suction or discharge. Positive displacement is suitable for compressing small amounts of air at high pressure, and can quickly dissipate the heat from compression. Reciprocating compressors tend to have lower output than others, but they can achieve relatively high pressures. Non-lubricated reciprocating compressors will typically use a Teflon piston ring instead of oil. The Teflon ring means there’s no need for lubrication for the pistons, rings and cylinders, because the material reduces wear. To improve life, these units also tend to opt for aluminum pieces in place of cast iron.Teflon rings will need to be replaced regularly, but they present little contamination risk to the compressor. Rotary screw air compressors also use displacement and generate the air compression by running a system of interlocking screws that draw in air and then pressurize it in a small area. Oil-free rotary screw compressors opt for non-contacting carbon ring seals to aid their cooling. These seals prevent any ability of oil entering the air stream inside of the air compression unit. Sectioned off coolant is used and kept on the other side of the seal for easy cooling. Oil-free rotary screws can see heat buildup over time, since they typically lack the ability to throttle the inlet, which will see those with large demands opt for the flooded models. Scroll technology is an advanced air compression system which includes one mobile and one stationary spiral which work together to bring air into the chamber for compression. Air is compressed within the spiral by decreasing the volume of the air, then directing the air to the center of the compressor to be cooled. The biggest advantage of this technology is that there is no residual friction or wear on the system, because the spirals never come in contact with each other. In many cases, these compressors also work smoother, with a different sound from other compressors. Some may require lubricant, but there are many common models that operate with an oil-free design. Oil-free air compressors are a more thoughtful choice and require careful consideration for your operations. The fundamentals of how oil-less air compressors do their work means you could be looking at lower costs, a lower carbon footprint and cleaner air. If you’re in an industry that demands air purity at 100% clean levels, then a compressor that doesn’t rely on internal oil is a top bet. These smaller units also tend to require less energy because they have more options for speed regulations. 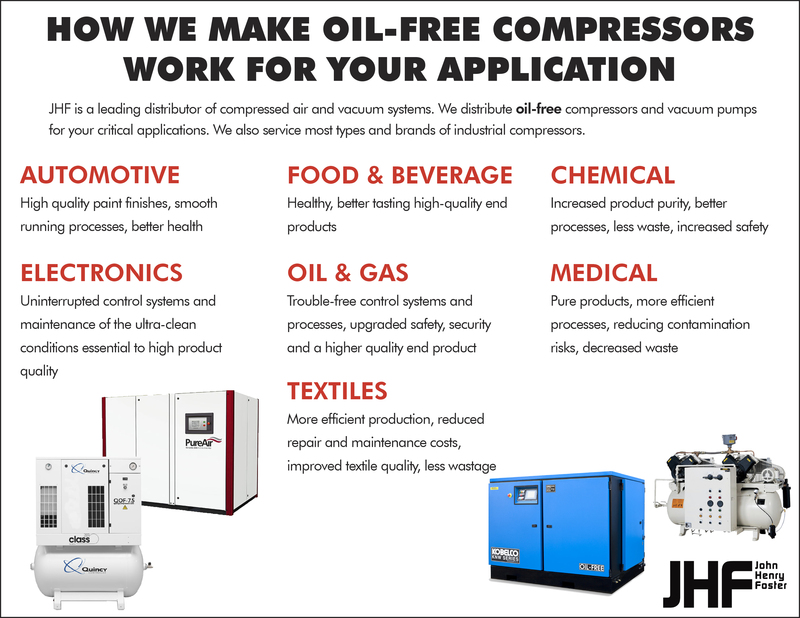 JHF offers a suite of oil-free air compressors and can make recommendations specific to industries such as electronics, pharmaceuticals, textiles, food and beverage applications. When you’re ready, contact us at 651.452.8452 or request more information below to get all of the information you need about oil-less models, and to receive a no-obligation price quote for your application. « Need Electrical Automation or Controls?